Calmin Rosacea Redness reducing day cream 50g Redness reducing daily moisturiser. Calmin Rosacea Night-time seabuckthorn 50g Intensive night time moisturising. 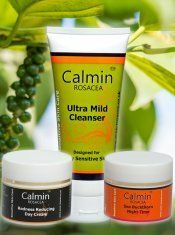 Calmin Rosacea Ultra Mild Cleanser 200g Use with our cotton wool disks for irritation free cleansing. For the visible reduction of redness & Calming of sensitivity and flushing/blushing. Effective make up and dirt remover, clearing impurities that can irritate sensitive skin. Wipe off with Cotton Wool for those who cannot even tolerate tap water. Designed for very sensitive skins.